Mardi Kirkland aims to help readers reach their full life potential. Today, many people often hold back from pursuing their dreams because of unfair self-judgment. Many Americans become so consumed with the fear of failure and disapproval from others that they tend to fall short of going after what they want. 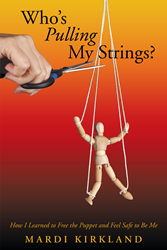 “Who’s Pulling My Strings?” takes the reader beyond theory and lists of things to do to change their life. It shows what it will be like to take these life-changing steps, and what to do when obstacles seem to be blocking their path. Kirkland’s new book is conversational as it guides readers through her journey to self-acceptance. Sharing her personal experiences, Kirkland’s book encourages readers to discover their true potential while breaking free from self-doubt and criticism. If graduate degrees were given in imprisonment in caring what others think of you and doing whatever it takes to become free, Mardi Kirkland would have PhDs in both subjects. A mother, grandmother, real estate agent, and life mentor, Mardi currently lives in Scottsdale, Ariz.